Sit…sit…. It is time for French Lesson 6 / Leçon française six to begin. Winter is on its way. An appropriate lesson for school today is winter words / mots d'hiver. Walkie promenade "ie" I think I made up this word. But its okay. I'm the teacher. Treats plaisirs This word is good all year round. Okay friends, now repeat after me….. " In the winter during our walk in the ice cold snow we wear our sweaters. We see snowflakes and ice. When we get home, we snuggle in our blankie and wait for treats." En hiver pendant notre promenade dans la neige froide de glace nous portons nos chandails. Nous voyons des flocons de neige et une glace. Quand nous revenons à la maison, nous nous blottissons dans notre blankie et attendons des plaisirs. Okay….our attention span is leaving. Good job friends…til next time…..have a fun day…..and no homework!!! En hiver pendant... oh crap! This is not the language for the Mango. I think Lily is gonna nap out on ya! Merci pour le... le... French lesson. Haha - Mommy knows all about l'hiver since she grew up in Montreal where it's tres TRES froid. So froid that it hurts our little paws and we won't stay out to do our business when we visit there. Thanks for the French lesson. I don't like to think about winter though so I'm going to pretend I didn't hear you say, "l'hiver est sur sa route". Vous êtes parfaits de dignes représentants de la France . Je blooblaay, melophoneaay, blaah de blaaah. Donne moi les plaisirs s'il vous plait!!!! Merci beaucoup! Je parle francais un peu. I would need a private tutor to learn French! Thank you for the lesson, I will practice it every day. 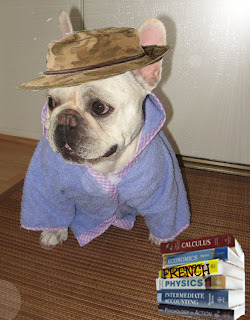 You look very french in your outfit, I didn't recognize you for a minute. I look forward to more. I am going to talk to Mommy now cause I need des plaisirs now! Plaisirs, plaisirs, plaisirs...I think I have it down now! 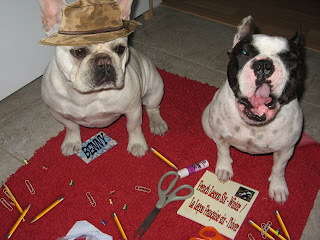 Thanks for the pawsome lesson Benny and Lily!! French is not easy to me but I am going to try it! bol. its a good thing there is no homework cuz I dont think I could ever learn this!!! Oooh. All that thinking made my head hurt. Think I need a nap now!! woo hoo! thanks fur the french lesson!